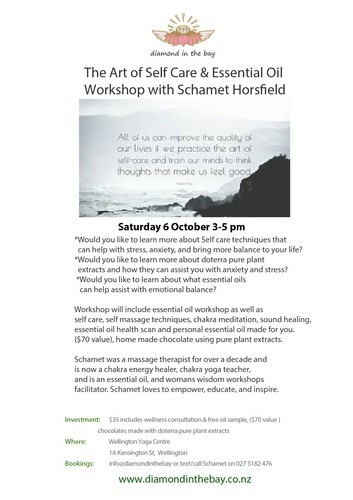 Saturday 6 October 3-5 pm*Would you like to learn more about Self care techniques that can help with stress, anxiety, and bring more balance to your life? - Would you like to learn more about doterra pure plant extracts and how they can assist you with anxiety and stress? - Would you like to learn about what essential oils can help assist with emotional balance? Workshop will include essential oil workshop as well as self-care, self-massage techniques, chakra meditation, sound healing, essential oil health scan and personal essential oil made for you. ($70 value), home made chocolate using pure plant extracts. Schamet was a massage therapist for over a decade and is now a chakra energy healer, chakra yoga teacher, and is an essential oil, and womans wisdom workshops facilitator. Schamet loves to empower, educate, and inspire.